Old drug = new treatment for parasitic skin disease? A coal-tar dye first produced in the 19th century, gentian violet is available over the counter as an antifungal agent. Dermatologist Jack Arbiser has been a champion of the inexpensive drug gentian violet for skin diseases. He recently teamed up with collaborators in Brazil to find that gentian violet is active against leishmaniasis, a disfiguring skin disease found in many tropical and subtropical countries. Caused by protozoan parasites and transmitted by sand flies, leishmaniasisâ€™ most common form produces skin sores but can also affect the nose and mouth and even vital organs. The World Health Organization has identified Kabul, Afghanistan as a world hot spot for leishmaniasis. In the journal PLOS One, Ana Paula Fernandes and colleagues at the Federal University of Minas Gerais showed that gentian violet and related compounds are active against Leishmania species in animal models. Conventionallly, therapy for leishmaniasis has involved antimony compounds, but resistance is growing. More recently, clinicians have used the drugs miltefosine and amphotericin against leishmaniasis, but severe side effects have been reported. â€œBecause it has a http://www.troakley.com/ proven safety record, gentian violet might be a useful treatment that can be used in developing countries as well as by US troops serving in Afghanistan,â€ Arbiser says. Arbiser also recently published a case report on the use of gentian violet, in combination with the immune modulator imiquimod, to treat melanoma. On January 8, Emory University School of Medicine’s Department of Medicine Grand Rounds had an unusual format: a debate between Otis Brawley, MD and John Petros, MD on the topic of PSA testing. Prostate cancer is the second leading cause of cancer death for American men. PSA (prostate specific antigen) is a protein produced by the prostate gland and its levels can be measured by a simple blood test.Â A higher number could indicate prostate cancer, but the test doesnâ€™t differentiate between an aggressive, fast-growing cancer, and one that is so slow-growing it wouldnâ€™t threaten a manâ€™s life. Brawley, professor of hematology and medical oncology and chief medical officer for the American Cancer Society, led off the debate arguing that studies show PSA testing to be unreliable and possibly leading to too many diagnoses and unnecessary treatment for prostate cancer. Petros, a professor of urology who treats prostate cancer patients, looked at other studies (more details below), which show the PSA test to be a tool that has helped save lives by detecting prostate cancer at earlier stages. Pretend you are offered the choice of taking a pill that will double the risk of prostate cancer diagnosis from 10 to 20 percent, but could decrease risk of prostate cancer death by one fifth: from 3 to 2.4 percent.Â “Do you feel lucky?” Brawley quipped. As a counterpoint, Petros cited National Cancer Institute epidemiology data indicating that the rate of metastatic prostate cancer has substantially decreased over the last few decades, since prostate cancers are now being diagnosed at an earlier stage. He also went over studies conducted in Sweden (Goteborg) and in Austria (Tyrol), which show significant reductions in prostate cancer-related mortality coming from PSA testing. PSA testing should be performed in the context of a physician-patient relationship, with men making an informed decision about the value of the information they will receive and the associated risks. Vans in supermarket parking lots â€“ more broadly, community- or employer-based screeningÂ — are not the ideal setting for PSA testing. The PLCO study, a NCI-sponsored randomized clinical trial to examine the effects of screening on cancer-related mortality, was flawed. In particular, the â€œcontrolâ€ arm had a substantial rate of PSA testing. Petros agreed with this last point and noted that more sophisticated tests than PSA already have been identified such as the prostate health index, which measures levels for three forms of PSA and may be more cancer-specific. Research being conducted at Emory by Carlos Moreno and colleagues also moves toward this goal. In 2011, his team published results in the American Journal of Pathology on a panel of biomarkers that can predict prostate cancer outcomes after prostatectomy. The Atlanta Business Chronicle recently had a story on a patent related to Morenoâ€™s research. Petros said a key question, and one he and Moreno are planning on testing, is whether the same biomarkers could be useful on prostate biopsy samples. 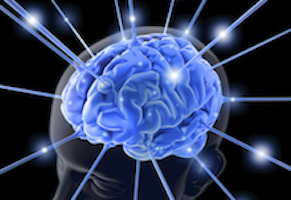 This could help make treatment decisions regarding surgery vs radiation. Biopsy-based tests could be combined with data based on urine biomarkers, to get around the problem of tumor heterogeneity and imperfect sampling, Petros said. For now, Petros said he believes in initiating a conversation about PSA screening with patients 50 and older, or younger if they have risk factors for the disease.Â Â He said the decision to have routine PSA testing, follow-up tests and prostate cancer treatments, is a very individualized process. Before all the excitement about embryonic stem cells, doctors were using hematopoetic â€“ that is, blood-forming — stem cells. Hematopoetic stem cells can replenish all the types of cells in the blood, and are the centerpiece of transplantation as treatment for diseases such as multiple myeloma or leukemia. They can come from two different places: directly from the marrow of a donorâ€™s hip bone, or indirectly from the donorâ€™s blood after a drug nudges the stem cells out of the bone marrow. Most hematopoetic stem cell transplants in the United States now use the indirect method of obtaining the stem cells. Until this fall, gold-standard randomized clinical trial results were not available to say which method is best for patient outcomes. Winship Cancer Institute hematologist Ned Waller was a key co-author of a study that was published in October in the New England Journal of Medicine addressing this question. The trial involved 48 centers enrolling 551 patients as part of the Bone Marrow and Clinical Trials Network (BMT CTN).Â Waller helped design the study, and his lab at Winship analyzed the cells in each type of graft as the central core lab for the trial. The study found no significant difference in the overall Ray Ban Italia survival rate at two years, and no difference in relapse rates or in acute graft-versus-host-disease (GVHD). However, there was a significantly higher rate of chronic GVHD with the use of blood stem cells. GVHD, a difficult and sometimes life-threatening complication for this type of transplant, involves damage inflicted by the transplant recipientâ€™s new immune system upon the liver, skin and digestive system. This finding will generate serious discussion among leaders in the transplant field about whether bone marrow or peripheral blood stem cell transplantation is a better treatment option, Waller says. A text Q + A with him follows. What was surprising about the results of this study? The equivalent survival was expected, and the increased chronic GvHD in recipients of blood stem cell grafts was suspected. What is surprising is that the relapse rate was similar between the two arms, in spite of the PBSC arm having more chronic GvHD. The accompanying editorial argues bone marrow should be the standard for unrelated-donor transplants. Do you agree? Yes, with the exceptions that Fred mentioned: patients with life-threatening infections and patients at high risk for graft rejection. What are the differences, procedurally, between bone marrow and peripheral blood as sources for hematopoetic stem cell transplant? Donating bone marrow involves a two or three hour surgical procedure requiring general anesthesia, in which bone marrow is removed from the hip bone with a needle and syringe.Â For peripheral blood stem cells, the donor undergoes five days of injections of granulocyte colony-stimulating factor and then a four-hour apheresis procedure to harvest stem cells from the blood. Blood stem cell donors have bone pain during the 5-day period of cytokine treatment, and bone marrow donors have more discomfort early after donation, but symptoms for both BM and PBSC donors have typically resolved by four weeks after donation. What proportion of each is now in use here? Marrow is the graft source in about 25% of recipients of grafts from unrelated donors, 10% in recipients of grafts from related donors. What proportion of HSCT is unrelated donor? For allogeneic transplants, about 60% receive grafts form unrelated donors (33% matched related donors and 7% mis-matched related donors). What kind of information does this study provide oncologists/hematologists about which option to use in which situation? Marrow should be preferred in recipients of grafts from unrelated donors when the conditioning regimen is myeloablative [substantially damages the patient’s existing bone marrow]. Does it depend on the type of leukemia/myeloma, the age or other conditions of the patient etc? This study only enrolled patients with acute leukemia and MDS [myelodysplastic syndrome]. It excluded patients with myeloma or lymphoma. Ages included children, adults up to 60. What other types of studies in this area are being conducted at Winship? We are studying the role of different constituents in the graft (BM and PBSC) to determine which are most important in shaping transplant outcomes (relapse, GvHD). We have an active pre-clinical research program utilizing mouse models to address specific questions related to engraftment cell homing and specific pathways related to immune activation. In addition, we will participate in a clinical trial of a new way of mobilizing blood stems that avoids the need for five days of G-CSF and uses a CXCR4 antagonist called plerixafor to mobilize PBSC. The properties of the plerixafor-mobilized PBSC may be more similar to BM cells with respect to GvHD. A recent article in Chemical & Engineering News describes the promising properties of curcumin, a compound derived from turmeric, in models of Alzheimerâ€™s disease. In addition to contributing to curry dishesâ€™ yellow color and pungent flavor, curcumin has been a medicine in India for thousands of years. Doctors practicing traditional Hindu medicine admire turmericâ€™s active ingredient for its anti-inflammatory properties and have used it to treat patients for ailments including digestive disorders and joint pain. Only in the 1970s did Western researchers catch up with Eastern practices and confirm curcuminâ€™s anti-inflammatory properties in the laboratory. Scientists also eventually determined that the polyphenolic compound is an antioxidant and has chemotherapeutic activity. Several research groups at Emory are investigating curcumin-related compounds. Psychiatrists Thaddeus Pace and Andrew Miller have been testing whetherÂ curcumin relatives may have useful properties with depression. Specifically, the curcumin-related compounds may have the ability to interfere with the connection (YouTube video) between inflammation and depression. Winship Cancer Institute researcher Mamoru Shoji has been exploring how to target curcumin compounds to tumor-associated endothelial cells by linking themÂ to a clotting factor.Â In the Department of Gynecology and Obstetrics, Friedrich Wieser is examining whether curcumin compounds can be helpful with endometriosis. Cells sometimes â€œfixâ€ DNA the wrong way, creating an extra mutation, Emory scientists have revealed. Biologist Gray Crouse, PhD, and radiation oncologist Yoke Wah Kow, PhD, recently published a paper in Proceedings of the National Academy of Sciences that shows how mismatch repair can introduce mutations in nondividing cells. Their paper was recognized by the National Institute of Environmental Health Sciences as an extramural paper of the month. The first author is lead research specialist Gina Rodriguez. 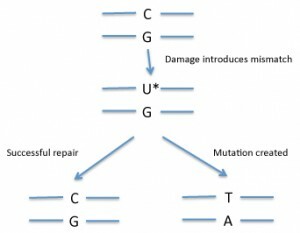 In DNA, a mismatch is when the bases on the two DNA strands do not conform to Watson-Crick rules, such as G with T or A with C. Mismatches can be introduced into DNA through copying errors as well as some kinds of DNA damage. 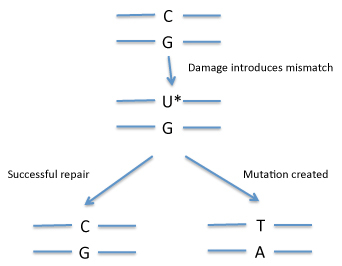 If the cell â€œfixesâ€ the wrong side, that will introduce a mutation (see diagram). So how does the cell know which side of the mismatch needs to be repaired? Usually mismatch repair is tied to DNA replication. Replication enzymes appear to somehow mark the recently copied strand as being the one to replace — exactly how cells accomplish this is an active area of research. In some situations, mismatch repair could introduce mutations into DNA. Overall, mismatch repair is a good thing, from the point of view of preventing cancer. Inherited deficiencies in mismatch repair enzymes lead to an accumulation of mutations and an increased risk of colon cancer and other types of cancer. But many of the cells in our bodies, such as muscle cells and neurons, have stopped dividing more or less permanently (in contrast with the colon). That means they no longer need to replicate their DNA. Other cells, such as resting white blood cells, have stopped dividing temporarily. Mutations in nondividing cells may have implications for aging and cancer formation in some tissues. Through clever experimental design, Crouseâ€™s team was able to isolate examples of when mismatch repair occurred in the absence of DNA replication. Although the Emory teamâ€™s research was performed on yeast, the mechanisms of mismatch repair are highly conserved in mammalian cells. Their results could also shed light on a process that takes place in the immune system called somatic hypermutation, in which mutations fine-tune antibody genes to make the most potent antibodies. Biochemist Paul Doetschâ€™s recent appearance in a Science magazine feature on laboratory leadership led to a conversation with him about the challenges of graduate school. He emphasized that scientific research is a team sport, and brilliance on the part of the lab head may not yield fruit without a productive relationship with the people in the lab. Doetsch suggested talking with Lydia Morris, a graduate student in the Genetics and Molecular Biology graduate program. Morris has been working in Doetsch’s lab for several years and is about to complete her degree. She has been examining the in vivo distribution of DNA repair proteins. In this video, Morris and Doetsch talk about the differences between turn-the-crank and blue-sky projects, and the importance of backup projects, communications, high expectations and perseverance. Sometimes you have to look at the whole picture, big and small. That was the lesson that emerged from Winship Cancer Institute researcher Erwin Van Meir’s laboratory, highlighted in a recent paper in Oncogene. Van Meir’s team has been studying vasculostatin, a secreted protein that inhibits blood vessel growth by tumors (hence the name). Vasculostatin was discovered by Balveen Kaur, now at Ohio State, while she was in Van Meir’s lab. Van Meir and his colleagues originally began studying vasculostatin because it is a product of a gene that brain tumors somehow silence or get rid of, and studying the obstacles our bodies throws in cancer’s way may be a good way to learn how to fight it via modern medicine. Eventually, it could form the basis for a treatment to prevent a tumor from attracting new blood vessels. 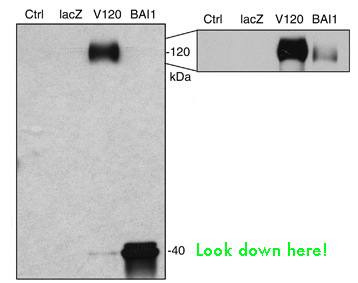 Vasculostatin is somewhat unique because it is a secreted fragment of a membrane-bound protein, called BAI1. BAI1 has an apparently separate function as an “engulfment receptor,” allowing the recognition and internalization of dying cells. Most of the secreted vasculostatin is around 40 kilodaltons in size, not 120 as previously thought. Graduate student Sarah Cork discovered that most of the vasculostatin protein being produced by cells is actually much smaller than what had been originally discovered. 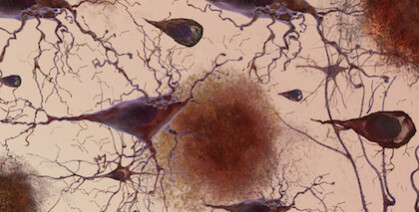 She and Van Meir were surprised to find that the smaller, cleaved form of the protein still has potent anti-angiogenic activity. The researchers were using a technique where a mixture of proteins is separated within a gel by electric current, transferred to a polymer sheet, and probed with antibodies. The large proteins appear at the top and the small proteins at the bottom. More broadly, Van Meir says that the finding adds to understanding about BAI1’s dual function in the brain and how vasculostatin (big or small) might be used in anticancer therapy. Cancer researcher Paul Doetsch is a prominent voice in a recent feature in Science magazine’s Careers section. The article gives scientists who are setting up their laboratories advice on how to manage their laboratories and lead by example. Doetsch holds a distinguished chair of cancer research and is associate director for basic research at Winship Cancer Institute. His research on how cells handle DNA damage has provided insights into mechanisms of tumor formation and antibiotic resistance.Â His lab includes five graduate students, two senior postdocs and one technical specialist. Doetsch says that he tries to maintain a lab culture that provides technicians, students, postdocs, and research faculty a sense of â€œownershipâ€ of their projects and to give the message everyone is making a significant contribution to the research enterprise, regardless of their specific title or role. Author Emma Hitt wasÂ herselfÂ a graduate student at Emory. This week, breast cancer researchers have been reporting encouraging clinical trial results with the drug everolimus at the San Antonio Breast Cancer Symposium. Everolimus is a mTOR inhibitor, first approved by the FDA for treatment of kidney cancer and then for post-transplant control of the immune system. Ruth O’Regan, MD, director of the Translational Breast Cancer Research Program at Winship Cancer Institute, has led clinical studies of everolimusÂ in breast cancerÂ and has championed the strategy of combining mTOR inhibitors with current treatments for breast cancer. She views the combination therapy as a potential alternative to chemotherapy for treating ER-positive advanced breast cancer when hormonal therapies have stopped working. When resistance to hormonal therapies occurs, Dr. O’Regan explained, additional signaling pathways become activated. Unlike chemotherapy, which targets rapidly dividing cells, mTOR inhibitors are an example of the kind of treatment that may block growth-promoting signaling pathways. Currently, Winship researchers are examining a combination involving everolimus and the EGFR inhibitor lapatinib for “triple-negative” breast cancer, a particularly aggressive and difficult-to-treat variety. Once esophageal tumors establish themselves, a patientâ€™s prognosis is grim and morbidity vast. But when lesions are caught early and removed, especially in the premalignant stage, the odds of survival markedly improve. When a case calls for it, Emory gastroenterologist Field F. Willingham, MD, MPH, uses a hybrid approach to ousting superficial esophageal lesions. Superficial esophageal lesions are commonly caused by acid reflux disease, or GERD. GERD occurs when stomach acid flows into the esophagus and can lead to a condition known as Barrettâ€™s esophagus, where the cells in the lower esophagus become damaged. This in turn can lead to dysplasia, or pre-cancerous cells. But for superficial cancers, it is now possible to remove a portion of the lining layer of the GI tract, containing the tumor, with an endoscope.Â This can help carefully selected patients avoid a major surgery. 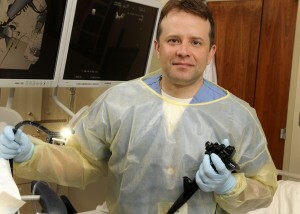 The technique, known as an EMR, allows the removal of superficial esophageal tumors and pre-cancer with an endoscope, a slender tube-like instrument. Detecting and removing esophageal tumors early is essential for a favorable outcome. Once tumors firmly establish themselves in esophageal tissue, the prognosis is grim and morbidity vast. In the past, a diagnosis of an esophageal tumor meant the removal of the esophagus and often the stomach. But now EMR can be used in tandem with radio frequency ablation. In surgical situations in which radio frequency ablation is not feasible, Willingham and his colleagues are beginning to use an alternate technique, known as cryotherpay, in tandem with EMR. Cryotherapy involves freezing superficial cells to rid the esophagus of suspect cells. Willingham and his colleagues are seeing evidence that using these very three very different, technologies in tandem or alone will provide patients with a better way to rid them of esophageal lesions while preserving their quality of life.